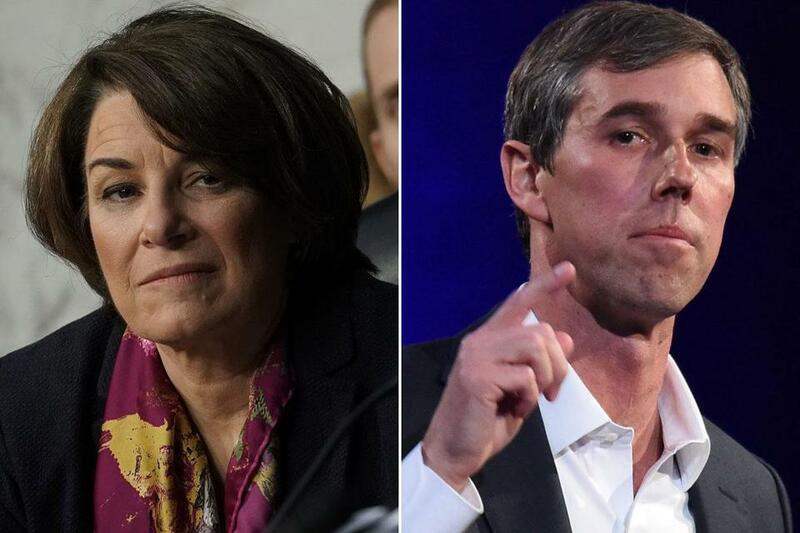 Do our standards for presidential candidates like Amy Klobuchar (left) and Beto O’Rourke differ by gender? When I wrote about US Senator Elizabeth Warren’s purported “likability” challenge recently, a reader insisted that voters’ reactions to her weren’t sexist but pragmatic. He had a point. You can dislike a particular politician without being sexist, of course, and many Democrats want a candidate who’s less confrontational, more unifying, to counter Trump in 2020. So I asked this reader to do a little experiment: Write back after Klobuchar is an actual presidential candidate. Let’s see if she falls into the same likability trap and whether it changes your view. Well, Klobuchar hasn’t even announced yet, and the Huffington Post has already posted a story detailing the ways in which Klobuchar has allegedly been not-nice. Reports of her alleged meanness were served up anonymously by former aides, but the story offered these data points: Klobuchar had the highest staff turnover of any senator for 16 years running. At least three people bowed out of consideration to manage her anticipated presidential campaign because of her reputation of mistreating aides, the story said. All of that is fair game — and may offer some satisfaction to the men out there who think their careers could now be threatened by workplace interactions they didn’t even recognize as inappropriate. These days, we call out bad behavior — even if it feeds into the familiar trope of the mean girl. Klobuchar supporters “question whether former co-workers who thought she was abusive were falling for sexist stereotypes about female leaders with high standards,” the Huffington Post story acknowledged. But while we’re at it, let’s consider our own standards for presidential candidates — and whether they differ by gender. Is “nice” what America wants from a president? Do we view our leader as a benevolent boss? We didn’t in 2016, noted Chloe Safier, a gender consultant who works with organizations that advance women’s equality. “If niceness was a qualifying trait for a candidate, we would not have a sitting president who built a public persona on a reality show wherein he brought people into a boardroom and yelled that they’re fired,” Safier wrote in an e-mail. Candidates need to be appealing, she noted, but ‘niceness’ is a gendered term. And, noted Kathleen Hall Jamieson, director of the Annenberg Public Policy Center at the University of Pennsylvania, warmth is often associated with a lack of competence. Conversely, a woman who is concise, direct, and aggressive is often regarded as cold, insufficiently feminine, and not likable enough. “The person every father would like their son to meet and maybe marry,” he added. That probably is not the standard he applies to every presidential contender. Now, consider Beto O’Rourke, a Texas Democrat who lost a much-hyped campaign to unseat US Senator Ted Cruz in November. A New York Times profile this week detailing his time in New York cast him as a mediocre punk rocker and sometimes-nanny who was adrift in his early 20s, unambitious, depressed, and, often, stoned — but always, unfailingly, likable. A female candidate would be ridiculed for such a narrative, some women protested on social media Thursday. But O’Rourke, a liberal darling, is being drafted to run for president. Jamieson agreed she could not imagine a female politician in the same situation.